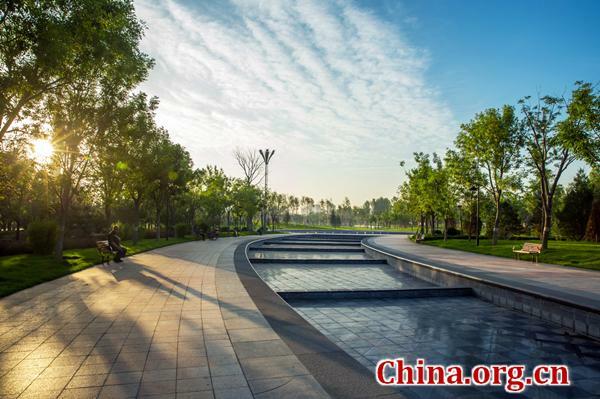 The Gu'an Central Park project, developed by Shanghai-listed China Fortune Land Development (CFLD), has won this year's British Association of Landscape Industries (BALI) National Landscape Awards for its innovative and eco-friendly design. BALI presented Gu'an Central Park an "International Award" which is given to projects undertaken outside the U.K.
Gu'an Central Park, covering 205,000 square kilometers, is part of CFLD's Gu'an New Industry City project which is located in Langfang city, China's Hebei province. Featuring artificial lakes, fountains, trees, lawns and facilities for recreation, the park has become an integral part of Gu'an New Industry City, serving as a model for future urban central park planning. Since the Gu'an New Industry City project was launched in 2002, the CFLD has insisted upon a "people-oriented" principle in its construction. The region has become "Beijing's satellite city". Over 40 designers from nine countries around the world were invited to contribute ideas for the planning and construction of the project. The design perfectly matches the climate condition of Northern China, providing an excellent place for local people to cool off in summer. "The central park project has impressed the BALI judges this year by its integration with the development of local areas in an innovative and environmentally-friendly way," the CFLD said. Information released by the CFLD shows that the fountain square with a mirror-like surface in the park is the largest one in China. The BALI National Landscape Awards, introduced in 1976, are held annually in a bid to recognize BALI members who have demonstrated exceptionally high standards of professionalism and skill in the execution of a wide variety of landscape schemes. It is one of the highest accolades in the landscape industry. The Gu'an Central Park project, developed by Shanghai-listed China Fortune Land Development (CFLD), has won this year's BALI National Landscape Awards for its innovative and eco-friendly design.